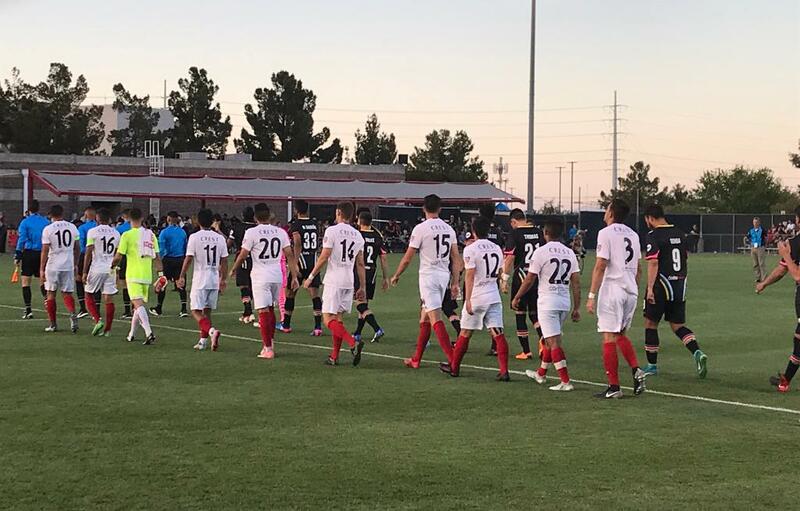 Despite overcoming an early two-goal deficit, FC Tucson couldn’t hold off Las Vegas Lights FC on Wednesday night in a 4-2 loss at the Peter Johann Soccer Field in the second round of the Lamar Hunt U.S. Open Cup. Las Vegas, which was making its debut in the competition in its inaugural season an expansion club in the USL, got on the board early with a pair of goals from Carlos Alvarez and Marcelo Altatorre in the opening ten minutes. But FC Tucson, which defeated La Maquina FC at home 2-1 in the opening round of the Cup last week, came storming back. In the 39th minute, an attack down the left flank led to a low cross from defender Amr Mokhtar that found forward Jason Romero. Romero needed just one touch to finish, slotting a shot from the edge of the six-yard box past Las Vegas goalkeeper Ricardo Ferrino to get the club on the board. Tucson midfielder Julian Gaona came within inches of tying the game before halftime. In first half stoppage time, Gaona hit a one-touch half-volley from near the penalty spot that had Ferrino beat but smacked off the crossbar and harmlessly away from goal. It didn’t take long for Tucson to get on level terms after the intermission though. In the 48th minute, a sequence of build-up passes led to a curling cross from Romero from just outside the box. Midfielder Adrian Valenzuela came charging into the penalty area unmarked and buried a right-footed equalizer into the upper right corner of the goal. The tie was short-lived. In the 56th minute, Las Vegas forward Samuel Ochoa got his head on the end of a cross in the Tucson box, directing the ball past goalkeeper Andrue Cases to put Lights FC back in front. Romero nearly knotted things up in the 61st minute, receiving a perfect through-ball from Valenzuela to get behind the Lights FC defense. But Ferrino, the goalkeeper, came charging out his net to cut down Romero’s shooting angle and make a diving save. Six minutes later, Ochoa scored again to reestablish Las Vegas’ two-goal lead in the 66th minute. It’s the third straight year that FC Tucson's U.S. Open Cup run ends in the second round of competition. The club will return to league action in the PDL when it visits Ogden City SC for a pair of games on May 25 and 26. FC Tucson will next play at home on June 1, again facing Ogden City. That match will kick off at 7:30 pm.